When the new Hasbro transformers models were being promoted when the movie launched, I noticed that only Optimus Prime and Megatron were available for the leader series, but what actually caught my attention was Jetfire, which can be transformed into a Lockheed SR-71 Blackbird! Based on pictures alone, I felt that this model must be a great one, and today I think I have been right. I bought the Hasbro Jetfire model (Leader series) today! Taking pictures for this while the item is still in box is difficult due to light reflection, but since I still don't have time to take care of the Optimus Prime I bought last week, I feel like keeping the Jetfire as is for the moment, but even when looking close through the box plastic cover, I can still sense the goodies of this model. 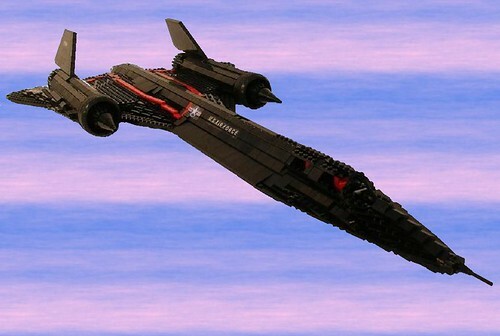 The Lockheed SR-71 Blackbird is a legendary warplane completing its mission, lego expert Lego monster (http://www.flickr.com/photos/legomonster/) has created a lego model for it (http://www.flickr.com/photos/legomonster/sets/72157603680930793/), it is a must see!